Although Dr. Leininger does not preach frequently in retirement, recent sermons are available on this page or in the Sermon Library (filed according to scripture text). For access to the manuscripts, simply click on the title(s) in which you have an interest. Feel free to download them to your computer to read at your leisure. All sermons Copyright © date delivered by David Leininger, all rights reserved, unless otherwise noted. 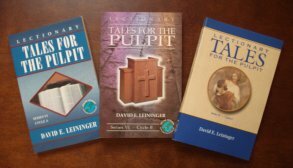 DR. LEININGER'S LECTIONARY TALES FOR THE PULPITfor years A, B and C are now available. From the publisher's back jacket notes, "Whether you pick up these books as relaxed devotional reading or are searching for a last-minute sermon illustration, you'll be delighted with the imaginative and inspirational stories in the latest installments of CSS' popular Lectionary Tales for the Pulpit series. David Leininger takes you right to the heart of the scriptures with a rich variety of captivating material illustrating the lectionary texts. His thought-provoking reflections are certain to enrich your spiritual life." Click here for ordering information. "Sonny Moneybags" is our nickname for the elder brother in Jesus' famous story of the Prodigal Son. Instead of the better known younger sibling, we look to the older for a change. Read Luke 15:11-32 in preparation for the sermon. The sermon title comes from an old Sports Illustrated article of the same name. So? Does God Care? Read Deuteronomy 15:7-11 in preparation for the sermon. The Epiphany of the Lord. The Twelve Days of Christmas comes to a close with gifts, not of French hens or partridges in pear trees, but with the more traditional gold, frankincense and myrrh from a text that has been described as the whole gospel in a few short paragraphs. Read Matthew 2:1-12 and Ephesians 3:1-12 in preparation for the sermon. The news has been coming at us at a furious pace these days and is being dominated by controversies over immigration, not only here in the USA but across the world. This is not a new issue and we are reminded of that from Scripture. Read Ruth 1:1-5; 4:13-17 and Romans 13:1-10 in preparation for the sermon. From the earliest times, the worship of God has involved more than simply reverent words. It has always included music. Why? Simply this: there are some situations when words are not enough. Read Ephesians 5:15-20 and Psalm 98 in preparation. Each year the question comes, "Whose birthday is it anyway? Under the circumstances, we might consider the birthday gifts we might offer our Savior. Read Matthew 2:1-12 in preparation. This is the Stewardship Dedication season at churches all over America. It comes up at St. Andrew by the Sea United Methodist on November 19. In preparation, we look back at the way Israel gathered in the tithe with an annual celebration in the hope that we can recover that same joyous spirit in modern giving. Read Deuteronomy 14:22-29 and Matthew 22:15-22 to see where we are coming from. Pentecost! "The Birthday of the Church." We recall that marvelous day in Jerusalem when people understood each other in ways they had not been able to do since the Tower of Babel. Is such a day possible again? Read Genesis 11:1-9, and Acts 2:1-21 in preparation. The Old Testament lesson from Isaiah is blatantly "political" in its calls for social justice. In a time in our nation when we are hearing religious references from all parts of the political spectrum, we consider what we hear from 28 centuries ago. Read Isaiah 1:1, 10-20 in preparation. For all the use we make of words in our lives, we tend to take them for granted. That is probably not a good idea. Read Genesis 2:18-19 and Acts 8:26-39 in preparation. With the PGA Tour coming to Hilton Head Island next week, our attention turns to golf, that delightful game which, as we learn, can offer some lessons for Christian disciples. Read Psalm 119:1-16 and I Corinthians 9:24-27 in preparation. The lectionary challenges us with a problem that is as modern as tomorrow but was apparently an issue in the church's earliest days - attendance. Read Hebrews 10:11-25 in preparation. If you would like to listen to what the congregation heard, click here. Since this pulpit appearance coincides with Independence Day weekend, rather than relying on the Revised Common Lectionary to choose a text, we look to the "Real Life" lectionary and choose something appropriate for the occasion. Read Psalm 33:1-12 in preparation. Click here if you would like to listen in. Tres grandes patriarcas, tres figuras de historia, un padre, un hijo y un nieto que han sido venerados constantemente por la gente de la fe. Si lo consideramos individualmente, encontramos algo notable: cualquier dios que podria amar ESOS tres, e incluye esos tres en el reino, podria amar e incluir cualquier persona. Lee Exodo 3:1-16 y San Lucas 13:18-30 en preparacion. God can use us, no matter what ; the wideness of God's mercy ; Using your gifts/talents. Read Exodus 3:1-6 and Luke 13:18-30. This week finds the Lectionary taking us back to ancient Israel and the seminal story of Jewish history - the birth of Jacob and Esau with the subsequent birth of Jacob's children, the patriarchs of the twelve tribes of Israel. It is a fascinating story and the family dysfunction that is evident makes the dysfunction of 21st century families pale by comparison. Read Genesis 29:15-28 in preparation. The 4th Sunday in Easter is traditionally "Good Shepherd" Sunday with the Psalm 23 read every year and the gospel lesson always coming from John 10 where Jesus says "I am the Good Shepherd." This year Good Shepherd Sunday coincides with the American celebration of Mother's Day providing an opportunity to reflect on the similarity between good shepherding and good mothering. Read John 10:1-10 in preparation. March 16 is the second Sunday in Lent. The message followed the lesson from John 3:1-17, the story of Nicodemus' night time visit with Jesus. St. Andrew by the Sea United Methodist Church, where we have worshiped regularly since our return to Hilton Head Island, annually observes the traditional Service of Lessons and Carols on the Sunday following Christmas. David delivered the meditation which normally follows the story found in Matthew 2:1-12. The Oakdale Presbyterian Church in Clover, SC (where we served from 1984-1988) has celebrated its annual HOMECOMING the last Sunday in July since the church was organized over a half century ago. This year, Dr. Leininger was invited to preach for the occasion. Since he loves to do that, he was glad to accept. The texts for the morning were Isaiah 40:1-11 and Luke 15:11-24. As we all know, November 11 is celebrated as Veterans Day in the United States, so this sermon is aimed at that observance. The text is from the Old Testament book of Job which deals with the question of evil in the world and wonders why life is so unfair, certainly an appropriate topic when dealing with the trials and tribulations of our veterans through the years. Click on the title to check it out. "The Good Shepherd" is the Lectionary's focus today. Meet him in Psalm 23 and John 10. Read Psalm 23 in preparation. The Day of Pentecost - the "birthday of the church," the day the Holy Spirit empowered that little band of believers in Jerusalem to change the world in the name of Jesus. Read Acts 2:1-21 in preparation. The lectionary gospel lesson this week offers us one of several versions of an intriguing story, the anointing of Jesus' feet by a woman of questionable reputation as he reclines at a dinner party. The Lord's response offers a powerful lesson concerning how the church should react when confronting similar situations. Read Luke 7:36-8:3 in preparation. In the Spring, so they say, a young man's fancy turns to love, and as Spring continues on Hilton Head Island in all its splendor, we encounter the subject in all its glory. Read Ephesians 5:21-33 in preparation. The Mater Familia of the Leininger clan, Rosalind Hurt Leininger Tinley, mother of David, Grandmother of young David and Erin, went home to be with the Lord early on the morning of March 29 following a long illness. She was born on January 26, 1920 in Albemarle, NC, met and married Milton Leininger in 1942, was the mother of six and grandmother/great-grandmother to a myriad of others. A celebration of her life was held on April 3 at the Abbott Memorial Presbyterian Church in Baltimore where her first husband served as pastor for 28 years. 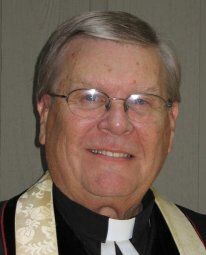 David presided jointly with Abbott's current pastor, the Rev. Paul Warren. How wonderfully fitting that the home-going of this quintessentially Christian disciple would be during Holy Week as the world anticipated the Day of Resurrection! Click here to listen to David's remarks as well as those of his sister, Jan Nelson, and brother-in-law Dennis Bouchard who reads a letter remembering "Rosie" from a long-time friend. Requiescat in Pace, Nana, requiescat in pace. WOW!!! is the reaction of Peter, James, and John on the Mount of Transfiguration. Read Mark 9:2-9 in preparation. Other sermons are available in the Library filed by scripture text (Genesis-Revelation).